Preheat oven to 200°C (390°F). 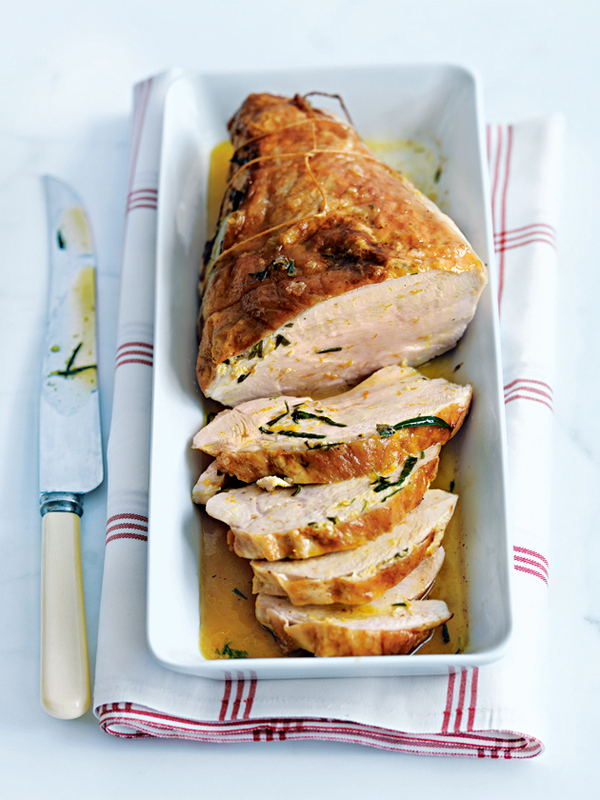 Place the turkey on a chopping board, skin-side down, and spread 2 tablespoons orange and tarragon butter between the tenderloin and breast. Sprinkle with salt. Turn over and carefully loosen the skin from the meat with your fingers. Gently push the remaining butter under the skin, brush with oil and sprinkle with salt. Secure the turkey with kitchen string and place on a rack in a baking dish. Cover with aluminium foil+ and roast for 20 minutes. Remove the foil and roast, basting every 10 minutes, for a further 30 minutes or until skin is golden and juices run clear when tested with a skewer. Rest for 10 minutes before carving. Serves 8–10. + Spray the foil with cooking spray so it doesn’t stick to the skin. roasted garlic Combine 5 cloves roasted garlic, 150g softened butter, salt and pepper. orange and tarragon Combine 150g softened butter, 1 tablespoon finely grated orange rind, chopped tarragon, 2 crushed cloves garlic, salt and pepper. chive and parsley Combine 150g softened butter, chopped chives and parsley, salt and pepper. Dijon and oregano Combine 150g softened butter, 1 tablespoon Dijon mustard, chopped oregano and salt.